ABOVE: Pedestrians cross the Piazza San Marco on temporary passerelle during an acqua alta. Acqua alta, or "high water," can make Venice feel like Atlantis. At its worst, in 1966, acqua alta flooded the city with more than a meter of salty lagoon water; more typically, visitors notice water splashing over canal banks or bubbling up through drains in the Piazza San Marco. The phenomenon is often mistaken for proof that Venice is sinking. Although the city did sink about 10 cm in the 20th Century because of industrial groundwater extraction, the sinking largely stopped when artesian wells on the mainland were capped in the 1960s. Today, subsidence is estimated at 0.5 to 1 mm per year, mostly due to geological factors and compression of the land beneath the city's millions of wooden pilings. A larger problem is the rising sea level, which will become an even bigger threat as global warming melts the arctic ice caps. Already, the frequency of acqua alta has increased from fewer than 10 times a year to more than 60 times a year in the last century. 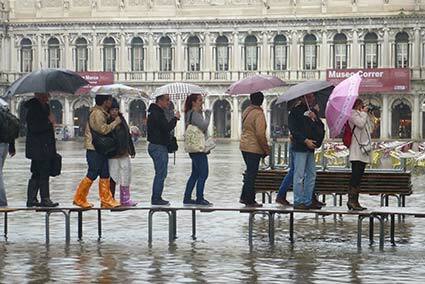 PHOTOS: Intrepid tourists wade in the Piazza San Marco. A very high tide (usually during a full or new moon). A scirocco wind blowing up the narrow, shallow Adriatic Sea, which forces water into the Venetian Lagoon. By official definition, acqua alta occurs when the tide is 90 cm (35.4 inches) above normal high tide. The phenomenon is most likely to take place between late September and April, and especially in the months of November, December, and October, in that order. However, thanks to global warming, it now can occur at any time of year. The Comune di Venezia and various international organizations have been working on solutions that range from MOSE Project floodgates at the Lagoon's entrances to raising of pavements in low-lying areas of the city. Much construction of the latter has already taken place, but it remains to be seen whether acqua alta can be tamed without closing off the Lagoon from the sea and turning it into a freshwater lake. ABOVE: A flooded fondamenta in Dorsorduro, between the San Basilio vaporetto stop and the Campo Santa Margherita. Most of the time, acqua alta is only a mild nuisance: You might have to sidestep a pond or two in the Piazza San Marco or avoid water that's splashing onto a fondamenta, or sidewalk, next to a canal. However, if you hear a siren wailing, you should be prepared for more serious flooding, especially in low-lying areas of the historic center. A siren means that an unusually high tide will peak in three to four hours. Depending on the height of the acqua alta and where you are in the city, you could encounter flooding for several hours before and after the tidal maximum. Such flooding can vary from a few centimeters to a major inundation like the one in the picture above. The city provides elevated wooden walkways in areas of the city that are prone to flooding; you can see a map of these pedestrian routes at most ACTV vaporetto stops. If you plan to spend time in Venice during the fall and winter months, you may want to pack rubber boots--especially for visits near the full moon or new moon, when acqua alta is most likely to occur. Alternatively, consider packing several plastic garbage bags and strings or elastic bands to hold them in place. Garbage bags may not be elegant, but they can help to keep your shoes and legs dry. 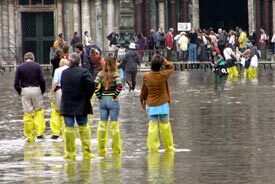 Another option is to buy rubber boots in Venice or acquire temporary plastic rain boots from souvenir stands and street vendors. However, if you have large feet, you may have trouble finding boots that fit--and in any case, you'll need to buy protection before the waters rise. Tip: For rubber or plastic rain boots, try Ratti, which has an excellent selection of men's and women's wellies in a wide range of sizes. The long-established hardware and housewares store is a few minutes' walk from the Piazza San Marco. ABOVE: Plastic boots for sale in the Piazza San Marco. 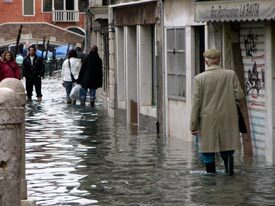 The "Flooding" category of our Venice Travel Blog has photos, firsthand reports, and advice on what to expect and do during acqua alta. The graph on this Italian-language page from the Comune di Venezia shows expected tides for the next several days. (Click here and scroll to the "Scarica i segnale" links to hear sample acqua alta sirens and warning tones in MP3 format.) Don't miss the maps of passerelle (raised walkways, shown by sestiere or district). This map doesn't cover all of the city center, but it does show the more touristed neighborhoods. 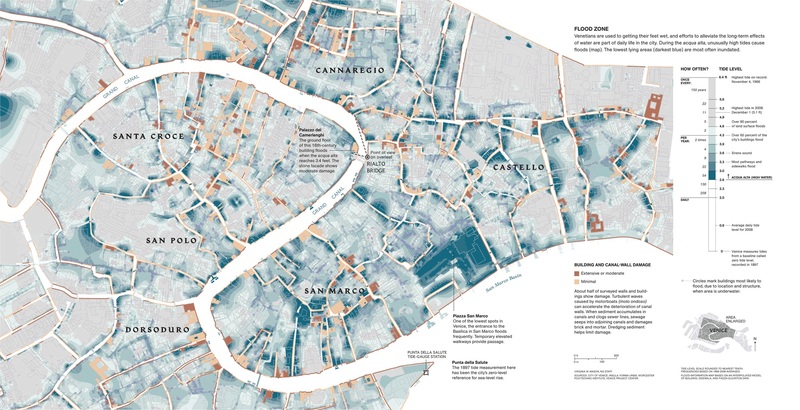 Blue-tinted areas (and especially dark-blue areas) are most prone to flooding when acqua alta occurs. Tip: For ease of reading, view this map in a maximized browser window on a large monitor. Download Venice's free--and official--tidal-forecast iPhone app or Android app for your smartphone. These large, dramatic photos show flooding on November 11, 2012, when Venice had the sixth-highest tide level in 150 years. 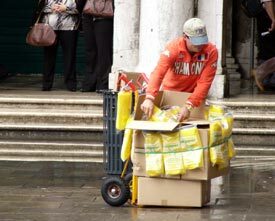 This eyewitness account by a British writer describes an unusually high acqua alta several years ago.